Features the first-of-its-kind playable home screen that kids can create. Watch night fall, add characters and discover a fun surprise every day! Includes 20+ apps: games, LeapSearch™ kid-browser (the kid web videos maybe subject to 3rd party advertising), eBooks, utilities and more! Discover our most advanced Android-based tablet, that adapts as your child grows, offering endless possibilities for exploration, learning and play. With the first-of-its-kind playable home screen, children can bring a town to life and watch their world turn from day to night, change the weather, add animated characters and discover a new surprise every day. Access games, apps, eBooks and more that draw from 2,600 skills, including creativity and problem solving (sold separately). Every LeapFrog app is reviewed to ensure there are no in-app purchases, no third-party ads and only age-appropriate experiences. Stay in control of what your child is ready for. Out of the box, kids can access only pre-selected, kid- web content* with the LeapSearch™ browser–add new websites when your child is ready. Features a 7" screen, an operating system based on the Android™ 4.4, an expandable 16GB memory, Wi-Fi, 2MP cameras, stylus, protective bumper and over 20 apps. (Wi-Fi required. Not compatibl with LeapFrog cartridges.) 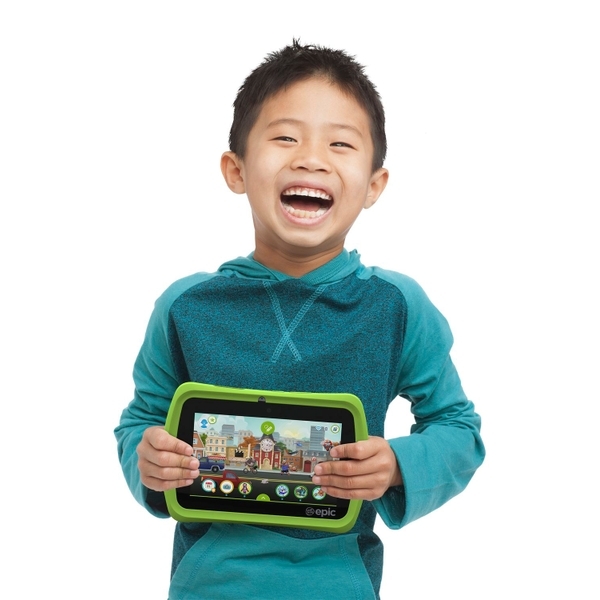 (*Source: 2015 LeapFrog survey of major U.S. children’s tablet brands.) *The kid web videos maybe subject to 3rd party advertising.